Well, I took the plunge and bought an iPad. And when I say I bought it, I should be more honest … work paid. Which is a bit of an experiment and a bit of a risk, as I persuaded my bosses I should trade in my expensive-needing-to-be-replaced, all-in-one laptop in return for the dual combination of cheap(er) desktop and a shiny iPad. I reasoned thusly … the laptop was under-specced for the office (as it crashes regularly when accessing our CRM database and InDesign publishing package, often grinding to a complete standstill) and over-specced for out of the office (when I usually only want to check email, calendar, web and view/light-edit documents). Better, then, to have a stable desktop PC and a mobile iPad. They bought it. Literally. So far, I’m pretty impressed. The keypad is easy to use right from the start (not sure I would ever be able to master enough digital dexterity get used to the teeny-tiny iPhone keypad: I’m sticking with my BlackBerry). And for only a handful of pounds I’ve been able to download more than enough apps to be able to sync and edit my work files. With luck, I may even find them again. 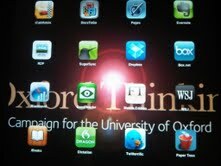 6 Best iPad Apps for Business Users by Christina Warren on Mashable / Business. 12 apps to supplement my iPad’s existing tools. And once my employers have finally (oh god, finally) ditched IBM’s hideous LotusNotes in favour of lovely Microsoft Office I should be able easily to access my work email and calendars as well. At which point my geek-cup truly will runneth over.